Headline - up to 30 characters which is usually visualized with bigger font size and sometimes bold. 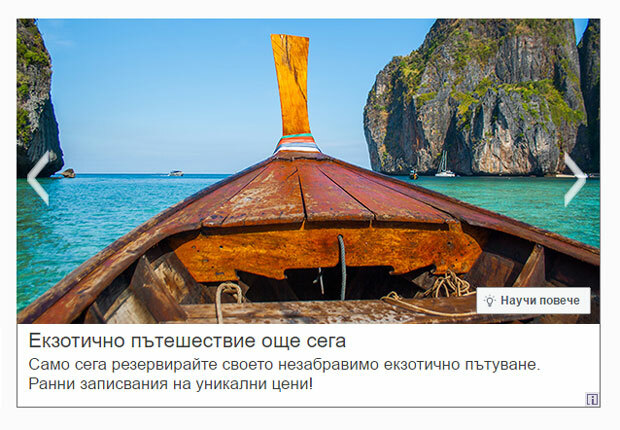 Link - the landing page you want to redirect the users who have clicked on your ad. We recommend you to avoid redirecting them to the homepage when the ad is for a specific product or service. Images - you can upload/select up to 5 different images in two resolutions and ratios. The different ratios are needed in order to generate the best possible layouts for your ad according to the different placements where it is displayed. You may use our crop module to resize and crop your images for optimal results or you can use our predefined gallery with stock images all for free. Keywords - up to 100 words per ad. They are important for the contextual targeting of the ads when there are matching words on a page where your ad is displayed. The keywords have to be one per line and no phrases are supported. Image dimensions: 300x250, 336x280, 300x600, 336x600, 970x250, 970x90, 728x90, 468x60, 160x600. The index.html file must contain <head> and <body> tags! Assets formats: jpg, jpeg, png, gif, txt, js, json, svg. 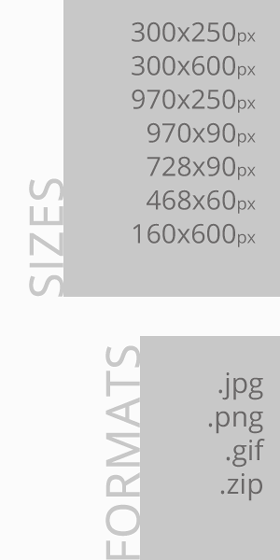 Required banner sizes (px): 300x250, 336x280, 300x600, 336x600, 970x250, 970x90, 728x90, 468x60, 160x600. B anner (.zip file) weight: up to 150 KB for all sizes. In order to define a link in the banner which will work correctly with EasyPlatform you have to insert our dynamic parameter for click correctly and according to your goal. Add a link with standard <a> html tag and define the EasyPlatform parameter for click: <a href="_eaclick_" target="_blank"> </a> and style the <a> to be clickable throughout the banner. In this way the platform will track the clicks and set the link according to the defined link in the platform when uploading or modifying the banner. This is recommended in order to be able to change the link fast and easy without modifying any code. All the links should lead to one domain only! Use image files with few colors; indexed png or gif files are much lighter than JPEG files. Do not use transparency if it is not needed. Never use heavy file formats such as raw or bmp. Choose the lowest quality and the maximum compression rate to get the best quality with minimal weight. Combine all the image files into a single file (spritesheet). In the CSS, use global class names instead of inline styles for each tag. When using animations, a crucial point to consider is performance in order to avoid overwhelming the CPU. Please refer to the IAB's best practices - page 18. If you want to use tags instead of uploading static creatives to our platform, we need to track clicks. This can be achieved by inserting our click tracking macro into your third-party ad tags. If you append our click tracking macro as a parameter in your tags it will generate a tracking url to track the clicks and redirect the user according to the final landing page url defined in your ad tags. Very often the final url contains characters and symbols which cannot be saved if not encoded with ()urlencode function. You can use various ways to encode the url. You have difficulties creating banners or native text ads for the platform? Our team is at your disposal for questions and cooperation.